Tiny Mixtapes is one of our favorite reliably great independent music blogs that accepts submissions from rising artists. We've featured blogs that champion independent music before, but there are just so many of them – and so many incredible ones – that we couldn't resist serving up another batch of our favorites! Check out our five picks below, complete with info for submitting your music. Good luck! Why we love it: Though based in the UK, this blog doesn't confine its coverage to any particular region – or style, either. Anything that twists norms and muddles genre blueprints might pique the interest of one of their many writers, who hail from all over the world. Pop isn't off limits either, as their manifesto points out. How to get featured: They recommend reaching out to a writer who's reviewed something similar to what you're submitting, but there's also a general email for new artist queries. Read up on all of the requirements here. Why we love it: This sizable bunch of self-proclaimed over-achievers caters to well-known independent bands and artists, but also is open to covering brand-new acts with promise. And while interviews and features are part of their game, it's their frequent and in-depth reviews that really make this blog a go-to for lovers of independent music of all varieties. How to get featured: An email address – submissions@tinymixtapes.com – is listed, but without any specifications, so refer to our blog outreach guidelines for help. Why we love it: There's an obvious opportunity for up-and-coming artists every week in WIB's roundup of the top five submissions. It's stiff competition, of course, as the site gets a ton of requests on a daily basis. Still, the fact that there's a specific, recurring post for on-the-rise artists shows their dedication to showcasing deserving new acts. How to get featured: They've got detailed instructions for submissions here. Why we love it: Remixes of songs by established artists are regularly featured, so this is a good one for DJs especially. But they also highlight totally original songs by independent hip-hop and electronic artists, so if that's you, don't be thrown off by the prevalence of remixed singles. There's plenty room for all, and founder Nick Guarino is open to everything. How to get featured: You can submit a song by emailing submission@thissongissick.com. Besides the email, no other information is provided, so again, refer to our blog outreach guidelines if you need some pointers. 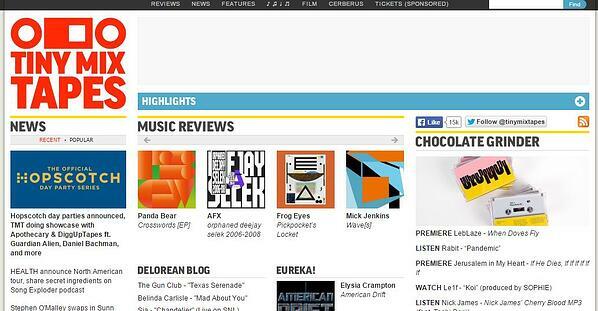 Why we love it: Don't expect to find analytical reviews or long-form features here. Eargasm lets the music speak for itself by posting videos with no further info beyond a few descriptive tags. The videos are all uploaded to their YouTube channel, so there's even more chances for listeners to check out featured artists and bands. They also compile playlists based on color, which is pretty cool. And there are no rules regarding style or location, despite that Eargasm is headquartered in Poland. How to get featured: Music can be sent to submissions@eargasmusic.com.